Introducing the Stress Reducer heavy duty office chair. As the name states, sitting in this comfortable office chair from ERA is likely to reduce your stress levels and let your worries melt away. In today’s busy work world, who doesnt need a little stress reduction? The Stress Reducer desk chair from ERA is the perfect solution for the big and tall worker, with a lifetime warrantied steel frame and floating spring suspension seat. 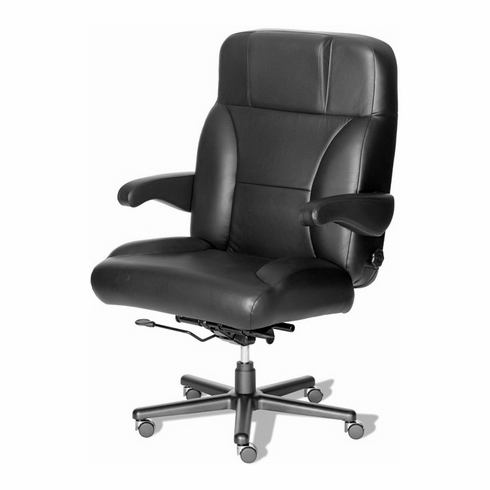 It features a 26” seat width for comfort and boasts all the features you’d expect in a premium office chair, including 360-degree swivel, tilt tension adjustment, and pneumatic seat adjustment. Add to that a rocker reclining seat back, seat slider for seat depth adjustment, four-way up and down or in and out lumbar support and four-way adjustable headrest, and you’ve got all the comfort you need. Choose from a variety of upholstery options for great visual appeal and even more comfort, and you simply can’t improve on this chair. Features of the Stress Reducer include a lifetime warranted all steel frame, floating spring seat suspension, resilient foam filled cushions contoured for comfort, a 26" wide seat, 4-Way adjustable lumbar support, adjustable seat depth, rocker reclining seat back, tilt tension adjustment, pneumatic seat height adjustment, 360-degree swivel, 2-way adjustable foam padded headrest, flip-up arms for easy entry/exit and a heavy-duty aluminum base with steel frame dual wheel nylon casters. Optional soft wheel casters available at no additional charge. Optional all steel 30-inch base or height/width adjustable task arms available for a minimal charge. Designed by a leading auto interior manufacturer, each ERA office chair is handmade in the USA and crafted upon order. This chair meets or exceeds ANSI/BIFMA standards.